My schedule has been very busy this last month and so I apologize for the lapse in sight updates. As a result I’ve noticed that some of the regular readership numbers have fallen, and appropriately so. Given an increase in the variability and difficulty of my schedule, I want to outline what visitors to the site should expect going forward. There will be two general types of posts going forward. The first type will consists primarily of links related to economics and economic headlines. These posts will include at most a brief commentary. The second type of posts will be more detailed analysis of economic issues. These posts will be less frequent. This structure will allow me to post more regularly while maintaining high-quality on a restricted schedule. I suggest readers check the site approximately once a week, as new posting frequency will tend to be less than it has in the past. Please note, you may subscribe via email or RSS if you would like to receive notice of new posts. I’ve included presidents Ronald Reagan, Bush 1, Clinton, and Bush 2 to give readers a bit of context regarding the dates. As Standard & Poor’s (one of the two rating agencies responsible for claiming Collateralized Debt Obligations (CDO’s) were a safe grade A investment) claims that the current level of U.S. debt is only now weakening the United State’s fiscal position, I’d like to remind readers how we got here. 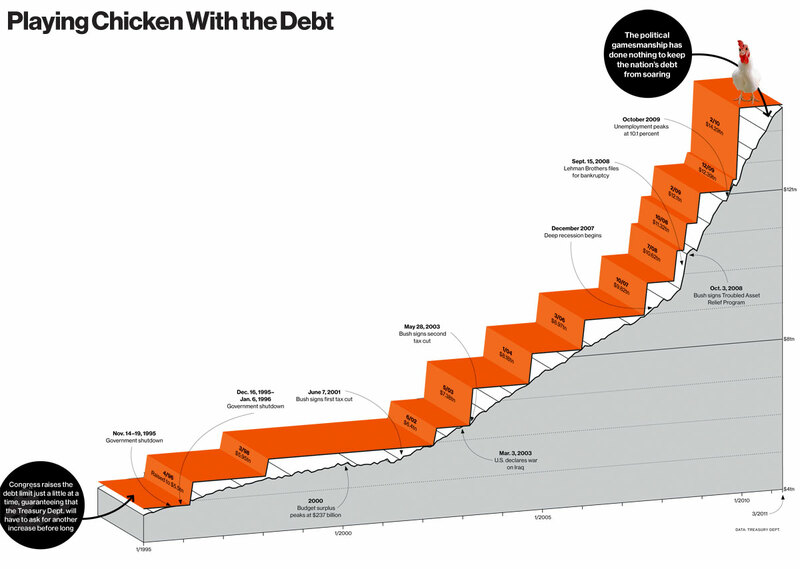 Note the flatness of the debt under Clinton, the rise under Bush, and the fact that the steep climb in U.S. debt starts during the beginning of the Great-Recession which also began under Bush. I’m saying this because the debt growth is nothing new… it has been like this for four years, and only now is noticed by the S&P. Standard & Poor’s, whose great ratings of CDO’s tricked public and private retirement funds, Banks, and Nations to purchase packaged junk while believing the claim it was gold is now claiming that only at this moment in time has the U.S. debt has finally become a fiscal problem. It seems like a political play to me. I would hope that everyone who hears their claim remembers that these same ratings agencies were unable to see the largest financial crisis in the last 100 years. Their ratings actually contributed to the crisis by allowing financial institutions with strict controls on the ratings of (risk-levels) assets they could hold to purchase CDOs, causing the junk to spread and infect much more of the financial system than it otherwise might. Things have been busy for me recently, so apologies for another light week of posting. I hope to get out some more self-generated analysis later next week. This video provides a good illustration of the Chinese property bubble. To fight the bubble China has implemented a series of price controls, enforced by the state-run capitalist nation. Laws like banning the purchase of multiple apartments, obligating proof of one to five years of tax payments in the city, requiring higher deposits, and the introduction of property taxes. The irony of all this is that an officially “communist” country is experiencing the same type of price-bubble crisis that afflicts advanced capitalist countries. In fact there was a similar type property bubble in the U.S. at the beginning of its heavy-industrialization phase with the California gold-rush. Even prior to that, during the colonial period under Britain, the East coast experienced a similar property bubble where wealthy Merchants and petty-Nobles from European nations established mini-fiefdoms from Maine to South Carolina. Effectively forcing the working immigrants to become serfs by purchasing large swaths of land and charging ridiculous prices for land they and government had only recently just stolen from Native Americans. 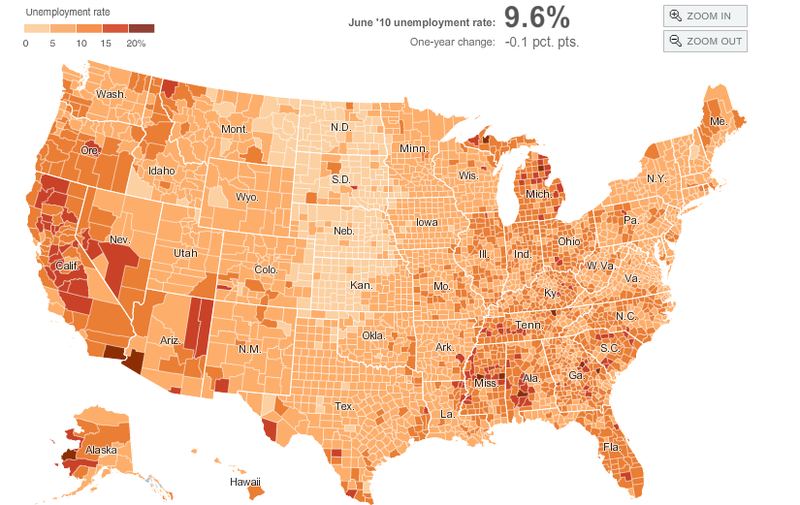 Click Here for an interactive -> Geographic Map of Unemployment from the New York Times. Try juxtaposing this map with my analysis of job-loss in the manufacturing sector during the 2000s, as you can filter the New York Times map by manufacturing regions. It seems that outside of California and some of the Western states, much of the worst cases of present 2010 unemployment is in the same regions which lost their manufacturing base during the 2000s. These are from a series of interviews with Cambridge Economics Professor, Ha-Joon Chang, on “Things They Don’t Tell You About Capitalism” based on his new book. What Professor Ha-Joon Chang is talking about is not really debatable theoretically. He is discussing traditional neo-classical economic theory, and therefore his statements are all valid within its orthodox theoretical standpoint. What he is pointing out is that in reality there are lots of limits which have interesting and contradictory results when applied to the theory. These limits imply that the type of “free-market” economics discussed by many economists and libertarians is incorrect and leads to inefficient and dangerous results in practice. As Professor Ha-Joon Chang puts it, this type of economics is not scientifically valid, but rather it gets so much attention because it serves to justify the status-quo. He has given longer speeches based on his book, if that is more your cup of tea. What is nice about these interviews is that they are shorter, a bit more to the point, and self contained. What follows is the first set of interviews, I will post follow-up interviews when they become available. Economics headlines from this week’s news, blogs, and op-eds.